Hrabstwo Sandoval (ang. 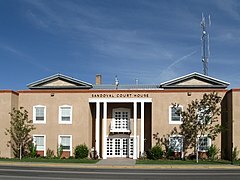 Sandoval County) – hrabstwo w stanie Nowy Meksyk w Stanach Zjednoczonych. ↑ US Census Bureau: Sandoval County. Population, Housing Units, Area, and Density: 2000 (ang.). [dostęp 2011-01-01]. ↑ US Census Bureau: Sandoval County (ang.). Quickfacts. [dostęp 2011-01-01].